Great bicycle touring resources & interviews plus a multi-year tour in the works – Go Bicycle Touring! Sheila Poettgen and Kai Forlie are following their desire to live more intentional and sustainable lives. They’ve redefined their priorities, drastically reduced their debt, and are in the process of eliminating things that prevent them from fulfilling their dreams of cycling around the world. 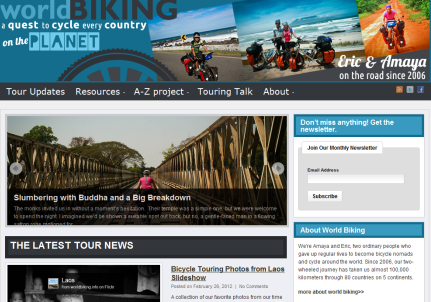 Their awesome new website, 2cycle2gether, documents not just their cycling journey but also provides bicycle touring resources and showcases interviews with touring cyclists. One of the sections I like most is Cycling Shorts, a series of short Q & A interviews with cyclists. Shelia and Kai find out what motivates bicycle travelers to pursue long term touring, what challenges they face, and what advice they would offer others dreaming of a bicycle tour. The first interview is a chat with Emma and Justin from Rolling Tales and in the second cycling shorts, Tom Allen from Ride Earth shares his thoughts about cycling around the world. The gear section is growing fast. Kai and Sheila cover topics as varied as water storage on a bicycle tour to DIY rack mounted lights. The articles are more than just a glossy overview of what’s on the market. They take great care to describe in detail what gear works best and even include helpful videos. The Tiny House section is good food for thought. Alright, this has nothing at all to do with bicycle touring, but just take a look. 2cycle2gether is an open-ended and self-supported global expedition beginning in spring 2011. Follow along and find out how Kai and Sheila fare as they embark on a cycling pilgrimage to reclaim their connection to humanity and the natural world.